French Crepes, a thin french styled pancakes made from the flour & egg mixture. The recipe is super simple and also it's the easiest batter making process for the pancakes that i have tried so far, but making thin pancakes is bit tricky for first one or two pancakes. Once you get the knack of pouring and swirling the batter fast, then it's like icing on the cake !!! Don't over heat the pan, otherwise you can't swirl the batter evening the crepe would end up thicker. Depends on the flour quantity, you may sometimes need additional 1 or 2 tbsp of water/milk. Let the batter set it for minimum 1 hr before making the crepes. Aww, Thanks Manjula for those kind words !!! Crepes with strawberry makes the table really beautiful.Such a awesome breakfast to start a beautiful day!! Making crepes at home is definitely a art, it may sound an easy task but its need some practice and you nailed them prefectly Sandhiya, those crepes looks amazing and inviting. Yeah Priya, it's bit tricky for first few crepes. Thanks. Your crepes look so lacy, soft and delicious. These are perfect to stuff with fruit, cheese and just about anything. Makes simple breakfast fancy. I too love the versatility of this crepes, Pavani. The crepes look so crisp and the presentation is amazing. Those strawberries and syrup with the crepes must be so delicious.. Your crepes have come out just perfect and love that whole set up! I could absolutely wake up to this any time of the week. This will be a great weekend brunch as well. Yeah, it make a great weekend brunch also, Sandhya. Beautiful presentation and the strawberries look very pretty in the platter. Wow the whole septup looks so sinful and inviting..I love crepes and won't mind having it for any meal! Prefect breakfast to wake up to. Beautifully presented Sandhiya! The best and easy breakfast dish ever but I am yet to try it as looking for an eggless version. The entire setup looks beautiful Sandhiya. Just one big thin crepe filled with fruits and drizzled with honey....yummmy. My kids use to love this fro breakfast when they were kids. I make also eggless version for my mother in law as she too loves them. 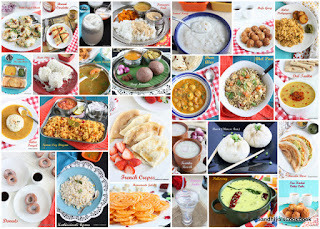 That looks pretty sandhiya, i too love simple and versatile recipes! I might enjoy this with some savory filling and my kids would love it with some bananas and honey!!! oh my i m drooling as i type my choices!!! Thin and soft crepes. Perfect to stuff with fruits or Nutella.